Along with other books, I love Bibles. I love reading different versions and having lots of them around so I can compare them. I don't always make time for quiet time in the mornings, so having a devotional is nice; it gives me something specific to read so I will sit down and do it. 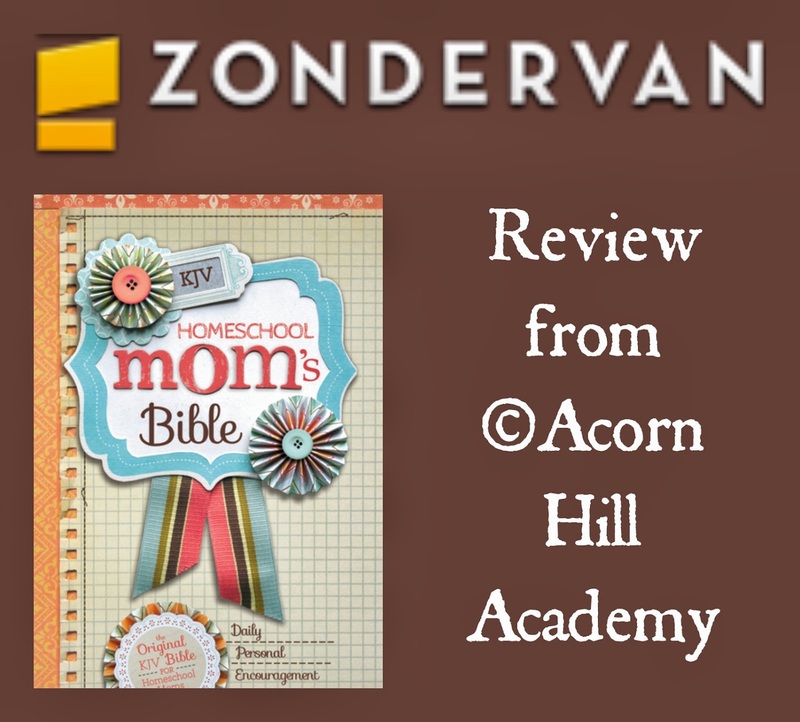 This Bible, the Homeschool Mom's Bible from Zondervan, provides both of those things in one lovely package! At my house, this is one less thing for me to misplace (if I had a Bible and separate devotional book, for instance), and that is a GOOD THING. I chose the King James Version, because my children and I are working on reading it together. I might as well keep it up on my own time, too. It's also available in the NIV, if you'd prefer that. They are both hardcover Bibles, nice and sturdy. I have several leather-ish bound Bibles, and while they are lovely, they don't always sit well on the shelf. The paper is not as thin as in some Bibles, which is nice, and the font is large enough for comfortable reading. My over-40 eyes appreciate that. Aren't they pretty? There are 365 devotionals in this Bible, spaced every few pages, with a border around each one so they are easily distinguishable from the rest of the text. 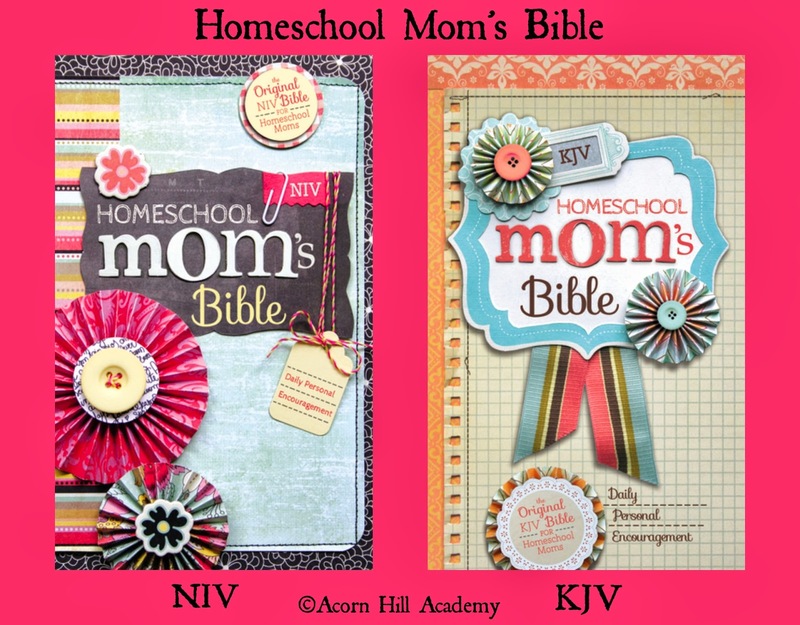 They were written by Janice Tatman, a homeschool mom with 25 years experience. 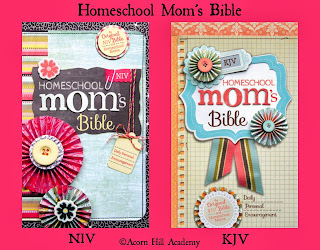 She wrote them for a daily devotional email sent out when she worked for a major curriculum supplier, and those pieces have been assembled into this Bible for homeschool moms. 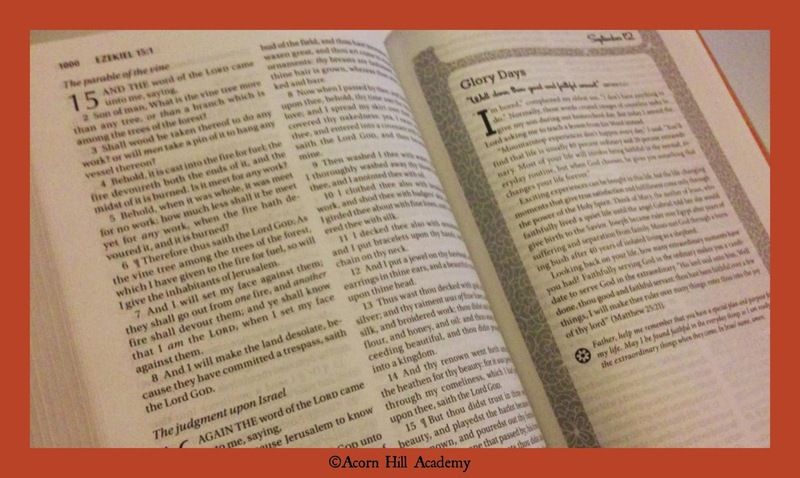 You could use the way the devotionals are spaced to read through the Bible in a year. It seems very do-able that way (and would not require me to keep track of a piece of paper with scheduled readings - another bonus). Additionally, there is a topical index in the back, so you can look up a particular issue and flip to a devotional written on it. I checked - "loneliness" is in there. I will need those often. As I read through some of the devotionals, I found that some of them really spoke to me, and others don't fit where I am right now, and I disagreed with the perspective every now and then. That's the beauty of something like this - I might read through it every year, these same devotionals, and different ones will touch my heart. Even if I never resonate with some of them, every one is food for thought. The one in the picture was a really good one to read, about the response when a child is bored. Like the author, I have a host of chores that I could suggest to a child who tells me they are bored, but I loved her response to this child, at this time: that life isn't always lived on the mountaintop. She said to her son, "Most of your life will involve being faithful in the normal, everyday routine, but when God chooses, he gives you something that changes your life forever." I don't know about you, but sometimes I struggle to be faithful in the daily routine. I find it difficult to stay focused on the things that I know are important every day, even though they involve taking care of my family. Sometimes I am distracted from homeschooling my children by feeling that I should be cleaning or cooking something, when in reality, they need my focused attention during school time. Sometimes I would prefer to read a book for fun than vacuum, or start laundry, or clean a bathroom. I need regular reminders to stay faithful to these things that are my job, and I appreciated the perspective in this reading. 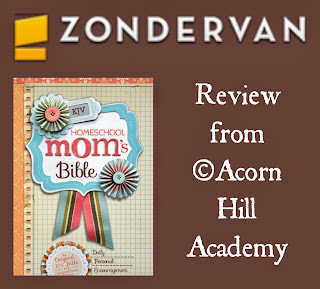 There is something special about reading devotionals written just for a homeschool mom. This is a different life I live, with unique challenges and blessings, and it's a special thing to have devotionals written by someone who has been there before me, you know? If you're in the market for a Bible, or know someone who might like it, I hope you'll check it out. Both versions, KJV and NIV, are available from Zondervan for $34.99 each.